His chemotherapy ended on May 16. He will undergo a blood test and CT scan on Monday. If all is clear, doctors will remove the port for his chemo on Wednesday. Chad Bettis is a major-league pitcher. 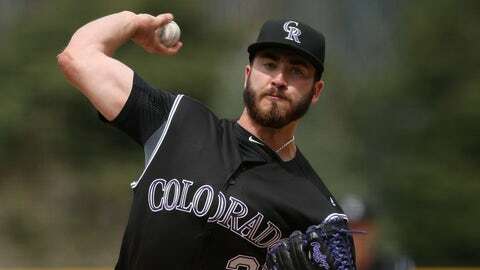 His goal is to pitch again this season for his team, the first-place Colorado Rockies. Bettis, 28, is recovering from testicular cancer. He underwent surgery and had one of his testicles removed on Nov. 29. Doctors told him on Dec. 22 that the surgery was a success, but on March 10, while in the middle of spring training, he learned that his cancer was back. Three rounds of chemo were prescribed, three weeks per round. 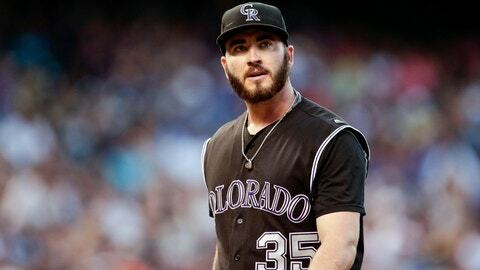 Doctors installed the port on the right-handed Bettis’ left side, under his clavicle, to make it easier for him to keep throwing. He said he is up to a distance of 75 feet, and starting to work with greater intensity. He also is lifting heavier weights and building cardiovascular strength by riding an exercise bike. Timetable? There is no timetable, cannot be a timetable, at least not yet. Bettis, though, said the recovery rate for his type of cancer is greater than 90 percent. In a telephone interview, he sounded cheerful, optimistic, determined, almost as if his next start was a few days away. Rockies general manager Jeff Bridich said that he, too, expects Bettis to return this season, citing the pitcher’s work ethic and inner strength. The Rockies, without Bettis and injured right-hander Jon Gray, have emerged as one of the biggest surprises in baseball while carrying three rookies in their five-man rotation. Bettis, who upon his return will be the team’s oldest starter, watches every game on TV, drawing comfort from the team’s success but longing to contribute. “It makes it easy in the sense that everybody is doing an unbelievable job. It’s awesome to watch everyone step up … fun in the sense of watching all my buddies compete and have fun out there,” Bettis said. When Bettis received the news in March — the news that his cancer had returned, just as he was preparing to start the season — he was not as crushed as one might expect. Yes, he thought his surgery had put him in the clear. But Bettis and his wife, Kristina, already had prepared for chemotherapy and radiation, researching both treatments after his initial diagnosis, not knowing at the time that doctors would recommend surgery. Bettis actually preferred surgery, viewing chemo as “scary.” But when he learned of his recurrence — and his need to undergo chemo — he and Kristina at least had an idea of what lied ahead. Kristina said that Chad never stopped smiling, remaining strong and positive throughout. Then again, the couple had reason to smile. 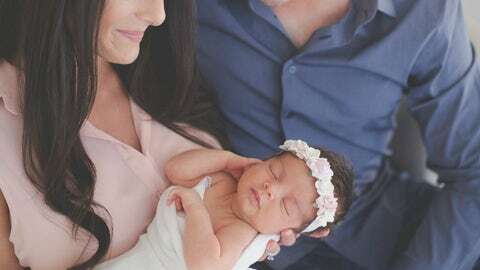 On March 29, nine days after Chad began chemo, Kristina gave birth to the couple’s first child, a daughter named Everleigh Rae. Chad Bettis, with his wife Kristina and daughter Everleigh. Everleigh Rae, in fact, played a role in her father’s recovery, before she was born. If not for Kristina’s pregnancy, Chad almost certainly would not have discovered the small, hard bump on his testicle when he did. Chad said he decided to check himself only after accompanying Kristina to a doctor’s appointment. As Chad went through his recovery, Kristina said that her pregnancy only added to the couple’s resolve. “It actually just encouraged us even more — we knew we had to be strong because we had our little girl coming,” Kristina said. “And when she came she just brought us joy. Chad Bettis, with his father Cody. Inevitably, though, the chemo took its toll. Bettis received the treatment Monday to Friday in the first week of each cycle, Tuesdays only in the second and third. The first week, Bettis said, would be “pretty brutal,” at times leaving him feeling terrible and exhausted. In between his first and second cycles, he ran his hands through his scalp while taking a shower, and a huge chunk of hair fell out. The next morning, he shaved his entire head. His experience, though, was not entirely negative. Bettis maintained his weight throughout, kept throwing, stayed active — and he had been in excellent shape to begin with. Bettis’ father, Cody, said that his son benefited from the competitive mindset he had developed as an athlete over the years. “There might be a moment of uncertainty. Then a few hours later, it’s, ‘What do we need to do? Let’s just get it done,’” said Cody, who owns a software company with his wife, Nadine, in Dallas. “He’s very pro-active and very positive in all aspects. I feel like that it’s a little bit from growing up in sports, having all sorts of training, that sort of attitude instilled. Oh, Bettis is a fighter, all right. Bridich learned that the day that he met the pitcher, when Bettis came to Coors Field to sign his first professional contract after the Rockies selected him 76th overall out of Texas Tech in the second round of the 2010 draft. At the time, Bridich was working under general manager Dan O’Dowd as the Rockies’ director of baseball operations. “There came a point where it was just kind of he and I and maybe one other person in this small conference room,” Bridich recalled. “He started talking about how he was going to prove all the other teams wrong — and some of ‘em two times over, for passing on him. “It was his life’s mission to prove those teams wrong. He had a huge chip on his shoulder. He had this inner sense of belief that he was going to become what he felt he should become, which was a very talented, very good major-league pitcher. 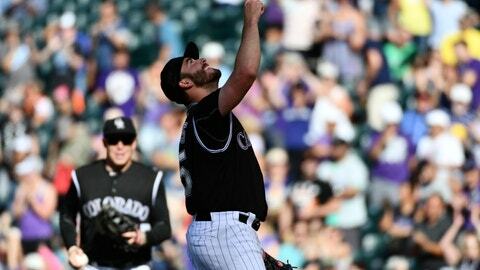 Bettis missed the entire 2012 season with a shoulder injury, then made his major-league debut on Aug. 1, 2013. Last season he finally stuck in the majors for good, leading the Rockies with 14 wins and 186 innings while compiling a 4.79 ERA. Cody Bettis, at least, believes that his son might return sooner than people think. 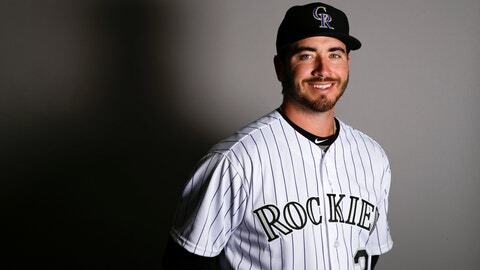 Gray will rejoin the Rockies first; he is expected to return from a stress fracture in his left foot by mid-June. Bettis’ recovery would provide another boost. “When we get Jon Gray and Chad Bettis back, that’s no different than adding two impact starters in a trade,” Bridich said. Bettis, like all cancer survivors, knows better than to look too far ahead. Still, a man can peek, can’t he? For many players and their families, few moments can top the player’s major-league debut, when a lifelong dream comes to fruition. For Chad and his family, though, the moment he pitches again for the Rockies might prove even more memorable. 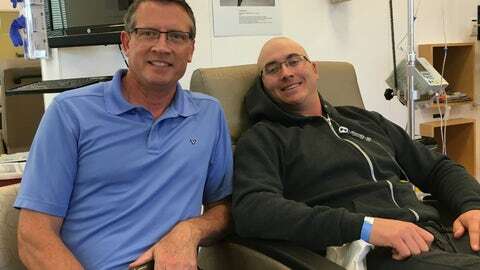 He is grateful to Bridich, who maintained almost daily contact, sometimes texting a simple, “How are you doing?” and other times trying to pump him up before another round of chemo, the way a GM might try to pump up a pitcher before a start. Chad and Kristina also mentioned the support of others — Chad’s teammates and their wives, manager Bud Black and his coaches. The next step for Chad — well, one of the next steps — is to give back. He plans to start a foundation to benefit the Testicular Cancer Society. And he has reached out to Pirates right-hander Jameson Taillon, 25, who recently underwent surgery and tested positive for testicular cancer. All that awaits on the baseball side is the completion of Bettis’ comeback. Bettis, as long as he is cleared by his doctors, will fly to Colorado from his home in Gilbert, Az., a week from Friday, then map out a plan with club officials. He expects that he will want to be aggressive and that the team will want to be conservative. But everyone will be united by one goal: Getting him back on the mound. Kristina will be in attendance the day he returns, accompanied by the newest member of the Bettis family, who will be attending her first major-league game. On that day, in that moment, the story will come full circle. “I can’t wait to cheer him on with little Everleigh,” Kristina said. Chad Bettis with his wife Kristina and daughter Everleigh.